Extended crewed missions to the Moon or Mars begin with finding a water supply. To access that water, NASA will require new technologies to mine through various layers of lunar or Martian soil and into ice deposits buried beneath. NASA is working with the National Institute of Aerospace (NIA) in Hampton, Virginia to sponsor the 2019 Revolutionary Aerospace Systems Concepts – Academic Linkage (RASC-AL) special edition Moon to Mars Ice and Prospecting Challenge. This technology innovation challenge seeks to advance critical capabilities needed on the surface of the Moon and Mars. The competition asks eligible undergraduate and graduate student teams to design and build hardware that can identify, map and drill through a variety of subsurface layers, then extract water from an ice block in a simulated off-world test bed. Interested teams are asked to submit a project plan detailing their proposed concept’s design and operations by November 15, 2018. 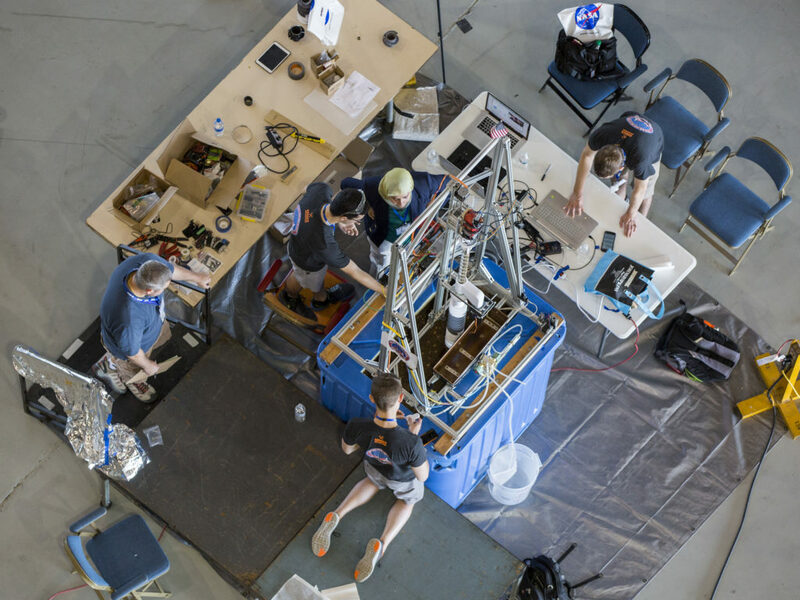 Up to 10 selected teams will receive a $10,000 development stipend to build and test their systems throughout the next six months before demonstrating their capabilities in a three-day competition held at NASA’s Langley Research Center in Hampton, Virginia in June 2019. The student competitors will develop technology that can be tested on Earth, but is useful in an off-Earth planetary environment. Differences in temperature, atmosphere and gravity are all considerations that teams will need to account for in their designs. In addition to building and testing an Earth-based water extraction and prospecting system, competitors are required to submit a written path-to-flight description of the modifications their system would need to operate elsewhere in the solar system. The 2019 RASC-AL special edition Moon to Mars Ice and Prospecting Challenge is sponsored by NASA’s Office of the Chief Technologist, SMD, STMD and the Systems Analysis and Concepts Directorate at Langley, with support from the Human Exploration Operations Mission Directorate’s Advanced Explorations Systems. RASC-AL is managed by NIA. In addition to this special edition Moon to Mars Ice and Prospecting Challenge, NASA and NIA have partnered to administer the separate 2019 RASC-AL competition, which aims to get university teams to develop new innovative concepts to improve the ability to access and explore destinations via the planned gateway in lunar orbit. This year’s RASC-AL themes range from using the gateway as the hub of new science capabilities to using it as the jumping-off point for humanity’s return to the lunar surface.